Mus musculus, the house mouse, is one of the most important species for scientific research. It consists of a complex of several separate lineages and nearly 3000 different strains of natural mutants, and transgenic and targeted mutant mice. Most of these strains are being studied in educational and research settings throughout the world. Mus musculus originated in Asia (probably India) and spread throughout Europe and Africa, and then to the rest of the world in historical times. Today in North America, the house mouse occurs throughout the continental United States and through much of Canada and Mexico. While medicine and humankind generally owe it a tremendous debt, the mouse can also be a disease vector and an agricultural pest. For many reasons, understanding the natural history of the mouse has significant economic impact. A huge proportion of research on the mammalian genome is now being conducted by 'mouse researchers'. Even though much of this research is aimed at genes and DNA sequences, documenting the phenotypic expression of those genes is also an important part of the research. As can be seen in the animations presented above, CT offers a highly informative means of documenting phenotypes for both systematic and biomedical research. The introduction of industrial scanners, such as the one used to scan this specimen, has only recently brought the power of CT to the visualization and analysis of specimens that are too small to effectively image with conventional medical diagnostic machines. A cutaway view of Mus musculus. Mus musculus, like all rodents, has a single enlarged evergrowing incisor in each half of the upper and lower jaws. Enamel is present only on the anterior surface of the incisors, thus they are 'self-sharpening' in that they wear away the softer dentine of the tooth. If the incisors are not worn down they can grow in an outward spiral, resulting in great difficulty with eating and a greater likelihood of injury or disease. A lateral view of Mus musculus. In all rodents the incisor is followed by a large diastema, or gap, that evolved from the reduction of incisors, canines, and sometimes premolars. In Mus musculus, as in all Old World mice and rats (Murinae), the premolars are lost leaving three molars. An anterior view of Mus musculus. Another characteristic shared by murines is a myomorphous zygomatic arrangement. In this arrangement, the maxillary portion of the zygomatic arch forms a flat plate-like structure (the zygomatic plate) to which the lateral masseter muscle attaches. The zygomatic plate forms the lateral wall of the infraorbital foramen, which is enlarged and somewhat slit-like for the passage of the medial masseter muscle originating on the rostrum. This arrangement of the masseter muscles facilitates powerful and precise anterior-to-posterior chewing motions. This whole adult ethanol-fixed Mus musculus was made available to The University of Texas High-Resolution X-ray CT Facility for scanning by Dr. Satoshi Oota of Riken Bioresource Center, Tsukuba, Ibaraki, Japan. Funding for image processing was provided by a National Science Foundation Digital Libraries Initiative grant to Dr. Timothy Rowe of The University of Texas. This specimen was scanned by Philip Watson on 20 September 2004 along the coronal axis for a total of 1217 slices. Each slice is 0.0842 mm thick, with an interslice spacing of 0.0842 mm and a field of reconstruction of 38 mm. Boursot, P., W. Din, R. Anand, D. Darviche, B. Dod, F. Von Deimling, G. P. Talwar, and F. Bonhomme. 1996. Origin and radiation of the house mouse: mitochondrial DNA phylogeny. Journal of Evolutionary Biology 9:391-415. Freye, M. S., and S. B. Hedges. 1995. Monophyly of the order Rodentia inferred from mitochondrial DNA sequences of the genes for 12S rRNA, 16S rRNA, and tRNA-valine. Molecular Biology and Evolution 12:168-176. Jaeger, J. J., H. Tong, and C. Denys. 1986. The age of Mus-Rattus divergence: paleontological data compared with the molecular clock. Comptes Rendus de l'Académie des Sciences, Paris, Série II 14:917-922. Lavrenchenko, L. A. 1994. Analysis of craniometric characters of house mice Mus musculus sensu lato (Rodentia, Muridae): a multivariate approach. (in Russian) Zoologicheskii Zhurnal 73:169-178. Macholan, M. 1990. Systematics and evolutionary relationships between taxons (sic) of the house mouse (Mammalia: Rodentia). Biologicke Listy 55:216-229. Vaughan, T.A., J.M. Ryan, and N. J. Czaplewski. 2000. Mammalogy, Fourth Edition. Saunders College Publishing, p. 136-174. To cite this page: Dr. Timothy Rowe, Ms. Megan Demarest, 2007, "Mus musculus" (On-line), Digital Morphology. 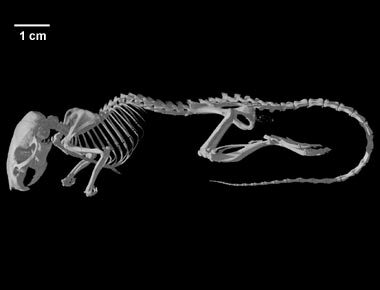 Accessed April 19, 2019 at http://digimorph.org/specimens/Mus_musculus/heterozygous/adult/whole/.